TORONTO, ONTARIO, July 6, 2018 – Toyota Supra is back at the track! Beginning in 2019, the globally-recognized iconic sports car will prove its championship mettle in the hotly contested NASCAR Xfinity Series (NXS). Supra will make its on-track debut in the NXS race at Daytona International Speedway on Saturday, Feb. 16, 2019. Toyota worked with its subsidiaries, TRD (Toyota Racing Development) in Costa Mesa, California, and Calty Design Research, Inc. (Calty) in Newport Beach, California, to develop a Supra for the NASCAR competition. The two teams applied key learnings from their prior collaborative efforts in NASCAR, which included the 2018 Toyota Camry that clinched the 2017 Monster Energy NASCAR Cup Series championship. Toyota has fielded Camry in NXS competitions since 2007, tallying four manufacturer championships while Camry has earned two driver championships and 142 wins. 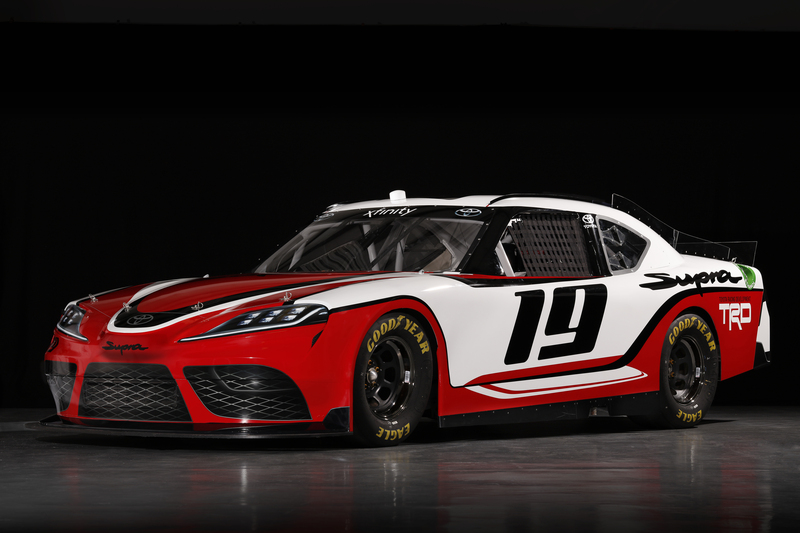 The 2019 season marks the first year Toyota will field a different model in all three of NASCAR’s national series – Camry at the Monster Energy NASCAR Cup Series (MENCS) level, Supra in the NXS, and Tundra in the NASCAR Camping World Truck Series (NCWTS). Reflecting Toyota’s commitment to motorsports, the manufacturer now showcases six models across eight series in America. Toyota Racing Development’s lineup includes: Camry, Supra, and Tundra in the NASCAR national series; Camry in the NHRA Funny Car competition; Camry in the ARCA Racing Series and regional touring series; 86 and Corolla Hatchback in Formula Drift; as well as engines for dirt midget racing and other series.